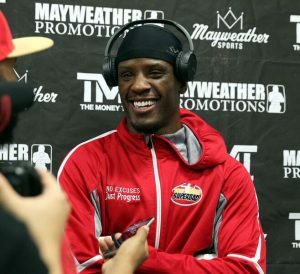 Super welterweight contenders Tony Harrison and former world champion Ishe Smith will face off with one another on Friday May 11 at the Sam’s Town Hotel in Las Vegas with the winner of this bout inching closer to title contention. A lot is on the line for both combatants heading into this crossroads bout as the winner will move on to better things, which could mean a title eliminator in the near future. The loser will suffer another setback and will have to rebuild towards fighting at the world class level again. The 39-year-old Smith (29-9, 12 KOs) is an 18 year veteran of the fight game and has been in the ring and sparred with the best in the world from different generation of fighters. Smith is looking to keep his momentum going as he’s coming off a close debatable loss to Julian Williams in his last bout, though many in attendance felt Smith was the deserved winner despite the scorecards awarding Williams with the unanimous decision win. Smith will now look to use his experience and veteran tactics to upset another young fighter who is looking to get back in title contention. ““Nobody has put on for Las Vegas like I have. I’ve done everything in my career the hard way. I took Cornelius Bundrage’s belt in his hometown. I’m not going to be beat on Friday night. “I’ve been in this game two decades and I’ve seen the highs and the lows. If everything works out, I’ll be victorious on Friday night. I’m ready to go on the road and take on anyone,” Smith said. Tony Harrison (26-2, 21 KOs) from Detroit is the odds favorite in this fight, though Harrison at the top level hasn’t proved whether he deserves to be as high as a 4-1 favorite heading into this bout and fighting in the hometown of Ishe Smith. Harrison showed promise early in his career and the Promotion had hoped with the charisma that he has, that perhaps they could’ve developed him into a marquee star, but he’s suffered setbacks in his two step up fights that would have taken him into another level had he won those fights. Harrison has since bounced back with two wins in stay busy fights since the devastating stoppage loss to current unified super welterweight champion Jarrett Hurd in Harrison’s only world title opportunity thus far in his career. The 27-year-old is very still motivated to get into the ring and get back into title contention with a win over Smith this Friday night. “Every time I step into the ring I’m extremely motivated. I’m fighting to feed my family. I’m from Detroit so we go through wars all the time. I was ready to jump on this fight as soon as they asked me about it. “This is a fight that will get me back to a world title fight. This can get me right back into a title eliminator. What better place to do it than the boxing capital of the world? Everybody who fights wants to be in the main event fighting in Las Vegas,” Harrison said. In the co-feature bout, Andrew Tabiti (15-0, 9 KOs) will look to keep his undefeated record intact when he takes on veteran Lateef Kayode (21-2, 16 KOs) in a ten round cruiserweight bout. 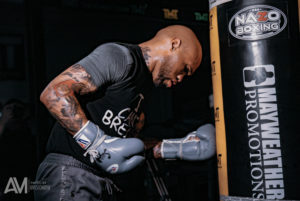 Fight week events kicked off Wednesday with a media workout for the Premier Boxing Champions on Bounce card headlined by former world champion Ishe Smith taking on super welterweight contender Tony Harrison this Friday, May 11 from Sam’s Town in Las Vegas. 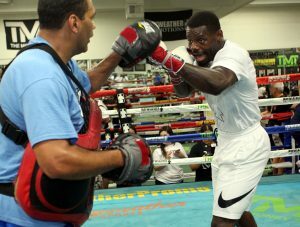 Coverage on Bounce begins at 9 p.m. ET/6 p.m. PT and also features unbeaten cruiserweight Andrew “The Beast” Tabiti, who participated in Wednesday’s workout, meeting Lateef Kayode for 10 rounds of action. “I’ve been in there with some great fighters throughout the year. My mentality is that no fighter is going to beat me who’s been stopped every time he’s stepped up. I have to do whatever I can to make sure that happens. “What motivates me is watching guys like LeBron James who have been doing this nearly as long as I have, and they’re still at the top of their game. That kind of longevity is what I strive for and that’s because I live that life inside and outside of the gym. “I’ve been training for three months for this fight and I just want a fair shake on fight night. I thought the scorecards in the Julian Williams fight were terrible. I can’t control it but it’s definitely something I want to avoid on fight night. “Nobody has put on for Las Vegas like I have. I’ve done everything in my career the hard way. I took Cornelius Bundrage’s belt in his hometown. I’m not going to be beat on Friday night. “This is a fight that will get me back to a world title fight. This can get me right back into a title eliminator. What better place to do it than the boxing capital of the world? Everybody who fights wants to be in the main event fighting in Las Vegas. “Ishe Smith has been in a lot of tough fights and he’s fought most of the top guys in the division. If I can get him into some danger, I want to see how his will is at that moment. I’m going to push him from round one and I think it makes for a good fight. “It’s part of my mental game to make him work round after round. If I see him slow down, it will make me push more. I appreciate what he’s done, but I don’t know how much more he has left. I want to be a champion like he was. “I’m excited to put on a good show and take care of a solid durable opponent. I know that my time is coming and this another chance to show off my skills. “Once I fight the top tier cruiserweights, they’re going to see what I’m capable of. I basically used Steve Cunningham’s game plan against him. I’m very adaptable. “It’s always important to have great fights like this to Las Vegas. With Ishe Smith being a native it’s even better. This is a good fight that could put Ishe back into the thick of things. People don’t raise their hand to fight Ishe. I think Ishe has a second wind right now and he’s refreshed at this point in his career. “Ishe doesn’t fight like he’s 39. There isn’t going to be anything that Tony Harrison can bring that Ishe hasn’t seen. Ishe has picked it up and I think the rest of the division knows that. It’s a deep weight class with a lot of possibilities out there. He has the ability to beat anyone out there. Bounce (@bouncetv) is the fastest-growing African-American network on television and airs on the broadcast signals of local television stations and corresponding cable carriage. The network features a programming mix of original and off-network series, theatrical motion pictures, specials, live sports and more. Bounce has grown to be available in 99 million homes across the United States and 95% of all African-American television homes. Visit BounceTV.com for more information. “I started when I was eight,” Ishe Smith says. “Kinda just getting bullied at school…my mom’s friend was into boxing.” So began what eventually morphed into quite the notable career for the first Las Vegas native to ever win a major title. “It’s a part of who I am” the 39 year old former champ states. Still, with a world title win on his resume and 29 victories to his credit, the affable Smith is growing wary of the Vegas way of doing things. “It was a good platform,” he says. 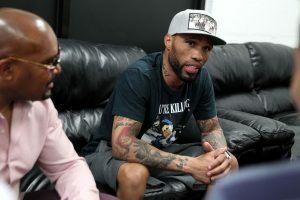 “People still recognize me from the show.” Television aside, Smith’s career got a serious boost when he became a member of Floyd Mayweather’s famed Mayweather Promotions in 2012. It was as a Mayweather Promotions fighter that Smith stepped into the ring as on the night of February 23’d 2013. The IBF light middleweight championship of the world was at stake, a championship defended by hometown fighter Cornelius Burndradge. Undeterred by the moment and location, Smith went on to win a majority decision. The first Las Vegas fighter to ever win a major title did so by defeating the first Detroit fighter to win a major belt since Thomas Hearns. “It was the greatest feeling in the world other than seeing my kids being born,” Smith says. “I had trained so hard for these ups and downs.” And being the first true Vegas champ? “That was key to me,” he adds. Smith ended up losing his belt to Carlos Molina, then lost a chance to attain the WBA world super welterweight title when he was outpointed by the masterful Erislandy Lara in 2014. Yet Smith’s still a major part of the Mayweather stable. He’ll be facing another Detroit fighter, Tony Harrison (26-2) on May 11th. While admitting that Harrison is no slouch, Smith is now at the point in his career where his perspective turns inwards when it comes to a particular fight. “I’m at the age now,” he says, “where I don’t focus on opponents. I just think about myself.” The fighter has clearly learned not to sweat the small stuff. “I’m a veteran,” he claims. “You don’t worry about what you’re making tomorrow when you got dinner tonight.” Being a part of the Mayweather team must offer some peace of mind, as well. I ask Smith about his toughest opponent. It doesn’t take him long to answer. “The toughest guy I ever fought was Randall Bailey,” he states. “It was a growing up lesson…I had to grow up very fast that fight.” Sometimes, it seems, you just have to jump into the deep end. “I don’t know what the hell I was thinking,” he laughs. Julian Williams defeated Ishe Smith tonight by unanimous decision. The scores were too lopsided to be taken seriously. In the first round, Williams used his quick, powerful jab to keep Smith at bay. But Smith didn’t back down and kept walking Williams down. During the second round, it became clear that all Williams has to offer is the jab. Smith, on the other hand, is a multi-dimensional fighter. He put in work to the body while also throwing jabs and rights to the head. Williams did utilize his right hand in the third round, but that was because Smith made him use it by bringing the action to Williams. During this round, Williams head-butted Smith causing a cut to open to the side of Smith’s left eye. During the fourth round, Smith slipped and immediately got up. But Smith was soon reprimanded for hitting Williams with a low blow. Smith continued to work the body of his opponent during the third round, but his cut opened again. The fight really started to get fun in the fifth round. Smith went for it—letting his hands go and hitting to the body and the head. Williams didn’t buckle, and he deserves credit for that. Just before the round ended, Smith landed a great right hand to the head. For some inexplicable reason, Williams stopped using his jab during the sixth round. His jab had previously been his only defense against the more aggressive Smith. During the seventh, Williams head-butted Smith again, opening a new cut, this time above the left eye. This time the cut was bad, and the blood was coming down into Smith’s eye. In the next round, the referee paused the fight to get the doctor to look Smith’s cut, which was bleeding. “I can see,” Smith said, and the doctor gave his okay. 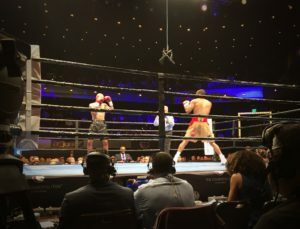 In the ninth round, Williams was more active, and the Smith’s hometown fans started chanting, “Ishe, Ishe, Ishe.” Williams was still forgoing the use of his jab, and because of this, Smith was able to land a series of clean combinations. And then in the tenth round, Williams landed another headbutt. I say “landed” because it’s hard to believe that this third headbutt was accidental. Williams came at Smith like a soccer player trying to go for a header. Smith was hurt and stood for a moment doubled over. But the fight continued, and Smith was more active, as he had been for much of the fight. Smith ended strong. It was a very close fight, but the scores did not reflect that at all. The scores were 99-91, 98-92 and 97-93 for Williams. But bad scoring is something fight fans have come to expect when a fight takes place in Las Vegas. However, the fight between Earl Newman and Lionell Thompson was judged fairly. In the first round, Thompson was more active but inflicted no damage to his opponent. Newman landed jabs, mostly to the chest, and seemed to be controlling the movement of the fight. The second round was uneventful, except for the fact that Floyd Mayweather—wearing a white turtle and grey sportscoat—began offering advice to Thompson from his ringside seats. Everything changed in the third round. It was during this round that Thompson landed a solid uppercut that staggered Newman. Thompson got his opponent against the ropes and may have finished him, had not the referee, Robert Byrd, interceded. Byrd didn’t stop the fight but instead offered Newman an eight count. It was unclear why Byrd decided to do this as Newman hardly touched the ropes. By the fifth round, it became clear that Thompson was now controlling the movement of the fight. He was making Newman follow him around. Worse, Newman wasn’t letting his hands go. During the sixth round, Thompson began throwing combinations to the body and Newman was staggered once. Newman started to pick up the pace a bit starting in the seventh round. He was throwing more combinations, but he was still too slow. For example, in the eighth round, he hit Thompson with a solid right but then paused before landing body shots, giving Thompson time to protect himself. Thompson wasn’t damaged by any of Newman’s shots. Thompson performed much better than probably anyone expected. He was faster, more aggressive, and, baring the eighth and ninth rounds, more active than Newman. Thompson also showed brilliance in backing up and using the ropes to evade his opponent’s punches. And so, it was no surprise when all three judges gave Lionell Thompson the win. 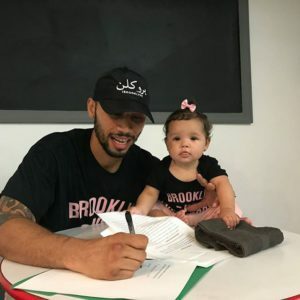 It was the right choice, even if it put the dreams of the top-heavy Earl Newman, two-time NY Golden Gloves winner and formally undefeated fighter, on hold. It’s hard to see where Newman goes from here. He needed a decisive win to progress to the next level, but he has shown that he just isn’t that impressive. This Saturday at the Cosmopolitan of Las Vegas Mayweather Promotions brings us some interesting fights—well, potentially interesting. The fights will air on Bounce TV starting at 9 PM EST. I’m particularly excited to watch the main event between Julian Williams an Ishe Smith and the undercard fight between Earl Newman and Lionell Thompson. Here’s why. In September, after a layoff of nearly a year, Newman fought Paul Parker, a contest that ended in a draw. Newman is a two-time New York Golden Gloves winner. He’s to be a talented boxer. However, he’s a top-heavy athlete who operates with a certain amount of caution in the ring. It’s unlikely that anyone is going to catch him with that one devastating shot. Back in 2014, Thompson was knocked out by a fresh-faced Sergey Kovalev, a devastating loss that came in the third round. He has since won more than he’s lost, and he’s still a solid fighter. He doesn’t seem to like to let his hands go. He may just be the perfect opponent for Newman. Like Newman, no one would call Thompson fleet-footed. As far as styles go, they’ll be equally matched. Newman won’t have to worry about a barrage of combinations coming his way, which means he can concentrate on doing what he does best—working down his opponent and slowly breaking him down. I’ll be watching to see whether Newman can finally distinguish himself as a future contender. He’s got skill and intelligence, but he needs an impressive win. The hard-hitting Williams may be best known for being the knocked out by Jermall Charlo. Williams landed a jab and right that just barely reached Charlo, who then stepped in with a sharp right uppercut. Williams’ legs gave out and he face-planted into the canvas. The referee started the count and, wavering slightly, Williams got to his feet. The fight continued, but only for a few seconds. Charlo came at him, throwing solid, though not hard-hitting, combinations. Williams fell to canvas again, this time on his back. Since his defeat to Charlo, Williams has fought once, against Joshua Conley. For most of their fight, Conley was so inactive that he could be said to be stagnant. And although Williams worked Conley down, I doubt anyone would say he put on an impressive performance. In fact, for a man who hadn’t received much damage, he looked almost as tired as Conley. Ishe Smith is twelve years older than Williams, and you can look at that two ways. One on hand, he clearly doesn’t have the speed he used to have, which should give the 27-year-old Williams a clear advantage. On the other hand, Smith has twelve years of experience on Williams. Also, Smith has faced superior opponents, and, even though he has lost to men like Erislandy and Lara and Danny Jacobs, he has never been knocked out. Smith is crafty. He knows how to take a hit, knows how to draw an opponent in, knows how to tire a guy out, he knows how to duck and weave away from punches. He is a consummate professional. Williams may be the favorite, he may have a better record, but from the looks of it, he still hasn’t gained his confidence back from his loss to Charlo—which means, Smith could surprise us. Smith has had a hard year, a hard life actually. Not a man given to self-pity, Smith remains driven despite all the obstacles he’s had to face. He has put his children before his boxing career but this year was particularly hard for him as the mother of his three children was executed. At thirty-nine, he has only so much time remaining as a professional fighter. This fight will determine whether he continues. It’s hard not to root for a guy who’s been through so much.